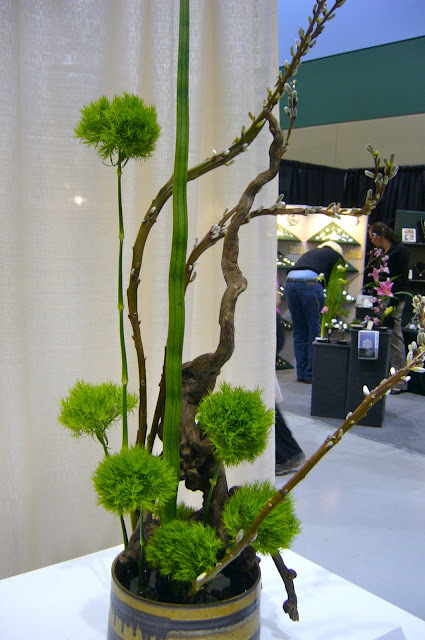 Back at the Northwest Home and Garden Show we saw a plant in an ikebana display we had never seen before. It immediately attracted both my husband and I because we love green “blooms”. As we neared, I could see that the stem looked a lot like a Dianthus, and it was one, but not one we had ever heard of: Dianthus barbatus ‘Green Trick’. It is only available to the floral trade but I imagine someday it will be made available to the home gardener. Like other green “blooms” it really is just a bloom without its petals. Instead, it simply has a lovely mass of sepals. After we saw it at the show, it started to show up everywhere I looked! I know that means that it must be a popular and trendy plant, and I am sure that it is because a search of its name brings up all varieties of inquiries online. You have all probably had these moments. You see a plant you have never seen before, and then you begin to see it everywhere. I don’t mind its popularity, because I think it is pretty special too. Don’t you? Dianthus barbatus ‘Green Trick’ in the newest Anthropologie catalog. Oh, I like that! I've not heard of it before but I'd love to try growing one. That's an interesting plant. I like green more than any other color so this plant would be perfect for me. We just saw these planted in front of the quilt shop in Cannon Beach, Oregon and read somewhere that a nursery in Jefferson, OR has them. So looks like they've made it to the home garden market. It's a very cool plant!